Jeffrey Runner was formally installed as dean of the College in Arts, Sciences & Engineering during an investiture ceremony Monday afternoon in Feldman Ballroom. University trustee Naomi (Nomi) Bergman ’85 opened the program, followed by remarks from Richard Waugh, interim dean of the faculty of Arts, Sciences & Engineering and professor of biomedical engineering; Gary Clinton ’73, dean of students from 1992-2016, University of Pennsylvania Law School; and recorded remarks from Sharese King ’12, doctoral candidate in linguistics at Stanford University. The investiture was presided over by Joel Seligman, University president and CEO and G. Robert Witmer, Jr. University Professor, with closing remarks by Waugh. Runner was named dean last June, replacing Richard Feldman, who stepped down after a decade. During Monday’s ceremony, Runner discussed his path from college dropout to dean, and his desire to make the University a place of inclusiveness for all. A prepared version of his remarks appears below. Good afternoon, and thank you all for coming today. The opportunity and responsibility to lead the College is truly an honor. As the undergraduate unit of Arts, Sciences & Engineering at the University of Rochester, our College has an unusual structure, but that structure provides unique opportunities for our students—more on that later. Let me first start by thanking a few more people. First, thank you Nomi Bergman for that generous introduction. Nomi and I were both members of the class of 1985 and met during a freshman English class in 1981. Nomi is now a member of the University of Rochester Board of Trustees, where she serves on the Board’s Student Life Committee, a committee I closely work with in my new role as Dean. She is also an active member of the Arts, Sciences & Engineering National Council, which is an alumni advising group for AS&E. It’s been fun keeping in touch over the years and a real pleasure to be able to work together. Runner joined the faculty of the School of Arts and Sciences in the Department of Linguistics in 1994 and received the Goergen Award for Excellence in Undergraduate Teaching in 2006. The Rhode Island native was appointed department chair in 2014 and promoted to professor in 2015. He has held a secondary appointment in the Department of Brain and Cognitive Sciences since 2005. Runner was a student at Rochester from 1981 to 1983 before transferring to the University of California, Santa Cruz, where he received his bachelor’s degree in linguistics. He received a PhD in linguistics from the University of Massachusetts, Amherst. Next I would like to thank President Joel Seligman. Joel cares deeply about the experience of the students here in the College. He is always available to help think through a problem or support exciting new initiatives. Thanks also to Dean Rick Waugh. Having founded the Department of Biomedical Engineering and then chairing that department for many years, Rick was a natural choice to serve as the interim dean of the faculty of Arts, Sciences & Engineering. He and I both started on the same day, so this first six months has been a tremendous learning experience for both of us. He has done an amazing job of getting his head around all the pieces of AS&E and has become a great leader for our school. Thanks also to today’s speakers. I was disappointed that Sharese King could not be here in person, but I really appreciate that she was able to offer some words about her work. While an undergraduate Sharese was a McNair scholar and a Handler Scholar. I’m so proud of her—she worked with me on her senior honors thesis when she was at the University as a linguistics major. I can’t wait to see how her career evolves—I know it’s going to be great! Gary Clinton is a graduate of the Class of 1973, and a former dean of students at the University of Pennsylvania Law School. Gary and his husband, Don Millinger ’76, have an ongoing interest in supporting LGBTQ and first-generation students. I am excited to partner with them on these endeavors and thrilled that Gary is here with us today. Finally, a quick shoutout to the amazing musicians from our own College music department. And a thank you in advance to PASApella, one of the newest a capella groups on campus, who will lead us in singing The Genesee at the close of the program. I have had a long connection with the University of Rochester. As I mentioned earlier, I was a member of the Class of 1985. However, my path from there to here was by no means direct. I loved the University, and like many students who attend a residential college, I made some of the best friends of my life during those first few years. But like many of our students, I struggled when I got here: I was used to getting easy A’s and suddenly I was surrounded by other smart students, many of whom had come here much better prepared. I wanted to study math, but my first C in college was in Math 161, first-semester calculus. Along the way, I took French and Spanish, but I was convinced that I wanted to study science so I tried other things, such as biology and chemistry, none of which excited me. I gave geology a go for about a year—I enjoyed the field trips to look for fossils and especially the Friday afternoon happy hours (the drinking age in New York was 18 then). But then I met paleontology and realized that I didn’t have a knack for memorizing every bone that ever existed. I was expecting one of these fields to just jump out and announce that it was for me. That didn’t happen. I grew up hearing stories of “knowing” when a field was right for you. My grandfather and uncle both found chemistry in college and became chemistry professors. My mother knew from the start of college that she wanted to be a teacher. It didn’t happen that way for me. I think it was because at the same time I was trying to find my field, something else was going on. During my sophomore year holiday break, I came out as gay. Though coming out can be hard now, it was a little different in the early 80s. I didn’t know any gay people at the U of R. A good friend of mine from high school, a sophomore at Smith College, had just come out and during that holiday break told me what a wonderful experience she’d had, how freeing being out was, and how accepting her friends had been. I made a list of about eight people I decided to tell, and consciously acknowledged that beyond those eight friends, others would find out and I would not care what they thought. Those first eight conversations were sometimes tough and probably very different from coming out conversations today (for example, there were no “It Gets Better” videos), but my friends all stuck by me and I am still close to almost every one of them! I also joined my first student group, the predecessor to today’s Pride Network. At the time it was called the Gay Academic Union. My social life shifted drastically, and I immersed myself in the small but active and activist gay community of the U of R.
While my social life vastly improved, my academic life did not. Finally, about halfway through my junior year, I decided to take some time off from school. I stayed in Rochester, supporting myself working as a waiter, and continued to hang out with my U of R friends. When my class graduated and left in 1985, I also left, and moved to San Francisco with my friend from Smith. I really enjoyed living in San Francisco, but it became clear to me that I was limited in what kind of employment I could get without a degree. Another friend from Rochester had transferred to UC Santa Cruz, so I visited him there and fell in love with the place. I transferred to UC Santa Cruz mid-year in 1987, and after living in multi-lingual and multi-cultural San Francisco, I decided I wanted to major in Spanish. Santa Cruz didn’t have a stand-alone Spanish major; you had to take linguistics as well. So, during my first quarter at UCSC I took a syntax course and it changed my life. I had found my own version of chemistry! It clicked, it was exciting, and I was good at it! Hindsight suggests this was an obvious choice for me: we say that linguistics is the science of language, and linguists have developed formal models of language much like you might find in math or computer science. I guess I just needed to see that language and science could be combined! In the subsequent year and a half, I completed a linguistics major with a focus on Spanish syntax. During that time, I had many wonderful experiences, but two stand out that I want to mention here. First, as part of the Spanish program I was able to spend a term living with a family in Morelia, Mexico; living in another culture “in” another language was a life-changing experience for me. Second, Judith Aissen, the professor who had been my instructor in that first syntax class, became my adviser and mentor and encouraged me to do a senior honors thesis. This was my first taste of independent research, and I loved it! Unbeknownst to me, UCSC had one of the top undergraduate linguistics programs in the country. That training and those connections helped me get into UMass-Amherst, one of the top linguistics PhD programs in the country. And while at UMass, I had another opportunity to live abroad, so I spent six months living in Barcelona, attending the Autònoma, where I worked with and learned from Catalan linguistics faculty and students. Fast forward to 1994, when I’m finishing up my PhD and the first (and only) job offer I get is from the University of Rochester, via a phone call from professor Greg Carlson—who is here today! I was a bit shocked and more than a little terrified that they’d figure out that I was a U of R dropout and not want to hire me. It was a surreal experience coming back to campus after nine years in a drastically different role. But I loved coming back, and I’ve been here ever since. As a faculty member, I became interested in undergraduate advising. I first served as the linguistics major adviser for about nine years, then as a pre-major adviser also for about nine years (with some overlap). Over the years, I’ve worked with my colleagues in linguistics to improve our undergraduate curriculum and create two new master’s programs. I was also proud to work with my colleagues in the Center for Language Sciences to develop an interdepartmental joint PhD program. During my last four years as a faculty member, I also served, along with Dean of Diversity Beth Olivares, as one of AS&E’s faculty development and diversity officers. In that role, Beth and I worked with faculty search committees to help them broaden their searches to increase the number of women and under-represented minority applicants, and ultimately hires. The lack of diversity at the faculty level is not isolated: it’s part of a general lack of diversity in academia. 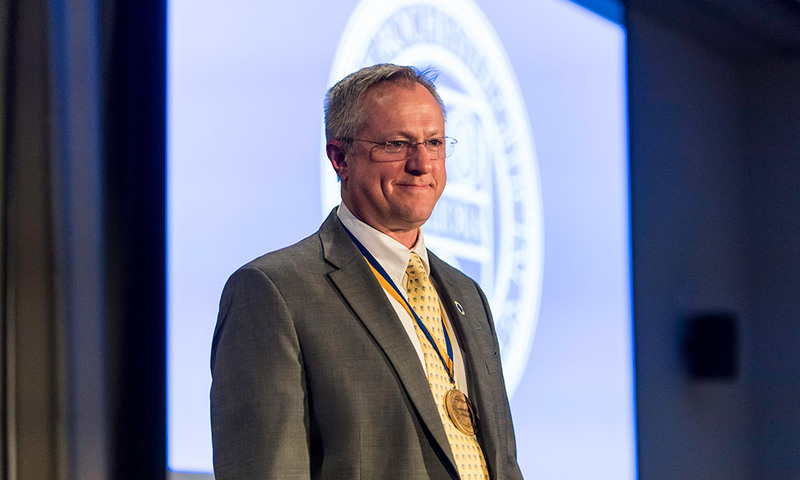 It’s been an honor to work with faculty and students to improve the climate at the University of Rochester and create meaningful career and academic opportunities for our students, faculty, and staff. Why the trip down memory lane? Well, besides the desire to come out as a U of R dropout, I think my story has pieces in it that help me in my current position as dean of the College. Now, back to that point that the College at the University of Rochester has an unusual structure. It’s something my predecessor, Rich Feldman, told me about, but I didn’t really appreciate this until I started meeting deans from other universities. It is not uncommon to have a dean whose entire job is devoted to the academic mission of the institution: curriculum, advising, and more. Then there’s a separate dean whose entire job is student life: residence halls, clubs, fraternities and sororities, and such. At this University, we have one dean—me—who is responsible for the entire student experience: from academics to student life. It is a tremendous responsibility—and I have a tremendous amount of help from [Dean of Students] Matt Burns!—but we believe this structure works. If done correctly, we have the opportunity to coordinate our students’ entire college experience. We see our students holistically. We recognize and embrace the fact that on a residential campus, our students are learning as much outside the classroom as they do within. This vantage point allows me to consider explicitly how academic activities including formal classes, undergraduate research, education abroad, internships, and community-engaged learning—and extra-curricular activities through our many clubs and organizations, performing arts groups, sports teams and Greek life—all complement one another to create what we call the 360-degree experience for our students. This is the opportunity that our College structure allows and actively encourages. The other piece that I could also go on and on about is our open curriculum. It’s part of what attracts such great students and it’s also what allows them to become the entrepreneurs of their academic careers and beyond. We all recognize the amazing academic opportunities our students have: we have world-class faculty using creative methods to teach what they know and love. I understand from my own experiences as an undergraduate doing research, living and studying in other countries, and participating in campus clubs, how meaningful these aspects of the undergraduate experience are—and not just that, but how much students can learn from these experiences. Undergraduate research allows students to develop their passion for scholarly work, and discover which areas do and don’t turn them on. Education abroad provides critical cross-cultural experience, helping to prepare our students to be global citizens. Internships allow students to learn about the kind of careers that may interest them, providing them with valuable experience that they can take with them forever. Community-engaged learning encourages students to develop partnerships with community organizations, identify problems, and work together to solve them. The 280 or so clubs and organizations provide a multitude of opportunities for students to learn critical skills that they can take with them: leadership, collaboration, creativity, and organizing. My goal is for every student to have the kind of experience the College is designed to provide—including everything I just mentioned. Even more importantly, I want them to feel that they’re part of a community—one community—that not only respects but embraces difference in all its guises: racial, ethnic, sexual, gender, ability, and socioeconomic—and all the amazing intersections that make up our Rochester community. We typically talk about this in terms of diversity and inclusion, diversity of background, diversity of opinions, and everyone feeling that they’re included. However, I’m starting to prefer the language of “belonging.” This institution belongs to all of us. If you’re here, you belong here. This is YOUR institution. This is subtly different from inclusion, which still implies that something from the outside is in some sense inserted, or added, to something that already exists. Belonging means that someone here is an equal member. Belonging has a kind of an “ownership” feel: the institution belongs to us all. I want everyone here not only to know they belong, but to feel they do. It is THEIR institution. And I will work as hard and strive for that goal. It will not be easy, I know, but it’s essential to say it out loud and work toward making it happen. Our students are amazing. I knew this already as a longtime faculty member. However, in the past six months as dean of the College, I’ve met many more students than I had in the past. I cannot express how impressed I am with them. But I have to say, I feel a little better about the future, knowing that our students are going to be there as leaders. I am surrounded by a great group of people in the Dean’s Office: Gloria Culver, Wendi Heinzelman, Dave Williams, Melissa Sturge-Apple, Alan Czaplicki, Emily Cihon-Fehnel, Kristine Seewagen, Jess Foster, Zoe Adams, Paula Losey, and the entire Dean’s Office staff. When I was considering applying for this position, Gloria tried to sell it by saying “We have a lot of fun.” And she was right! It’s a wonderful group that actually feels much like a family. I also work with many, many wonderful talented caring people, who really make this place run, including Beth Olivares, Marcy Krauss, Matt Burns, Norm Burnett, Vicki Roth, Ty Stewart, Joe Testani, Deb Rossen-Knill, Denise Yarbrough, Laurel Contomanolis, Nancy Specht, and many others. I want to thank my friends and colleagues from linguistics and the Center for Language Sciences: Greg Carlson, Joyce McDonough and Mike Tanenhaus. We’ve all been together for more than 20 years and I wouldn’t be the scholar I am without their support. Before wrapping up there are three other people I would like thank for their love and support: my parents Joseph and Patricia Runner, who came from Rhode Island to attend this event; and most importantly, Javier Bautista, my partner, my supporter, my cheerleader, and the one person who keeps reminding me not to let becoming dean go to my head (in other words, I still have to do the dishes). Thanks to you and to everyone who is here today.